Whatever the event you are organising Chats du Quercy is always keen to encourage active participation and spread awareness. Let us know your plans and we will publicise them on our website. If you like knitting and have a bit of spare time, here is a knitting pattern to make you laugh – a Cat Hoodie!! We can sell these in our shop and in the Rescue Centre. Cats can get bored too! In our Rescue centre we do our utmost to keep the cats and kittens entertained, at the end of the Cat Hoodie article is a very simple knitting pattern for toy mice. Our cats love these and they keep them entertained for hours! If you can knit some items for us, please send the finished articles to the normal address. If you have any unwanted, good quality items please think of donating them to us for resale . Contact us at the normal address. One great and simple way of raising funds is to offer your services as a cat sitter to your friends and neighbours. Cats are usually solitary animals that like to stay in their own territory and in their own surroundings. 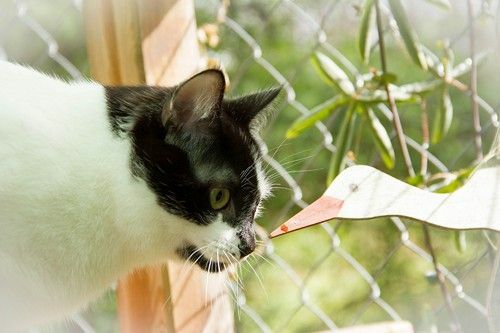 By offering to look after the cat in its own environment, owners can organise their voyage happy in the knowledge that their cat(s) is safe in its own home, unstressed and being looked after by a trustworthy friend for the period that they are away. For this service, the owners can make a donation to Chats du Quercy to help other more unfortunate cats and kittens who don’t yet have a place to call their own home.